Celestion Speaker IRs – Don’t Miss Our Black Friday Deals! Four Days of Amazing Black Friday Deals With CelestionPlus! 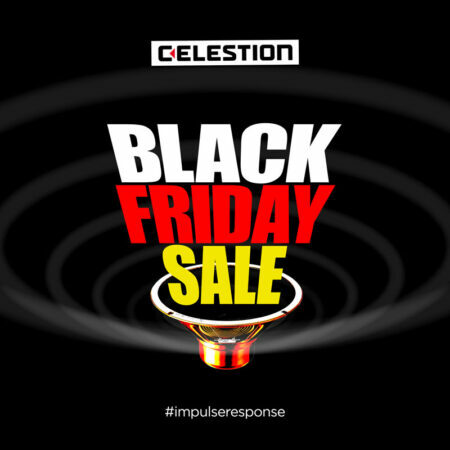 Black Friday is finally here – which means it’s time for us to offer you some amazing deals on our entire range of Celestion impulse responses! * This will be your best chance to get your hands on some authentic Celestion IRs at amazingly low prices. From 00:01 GMT on Friday 23rd November, we’ve got four days of incredible offers over the Black Friday Weekend, so keep checking back for our daily deals! Friday – BUY 1 GET 1 HALF PRICE! Buy a single IR cabinet and get the second half price! Torn between the G12M Greenback and the Vintage 30 for your metal or hard rock tone? Can’t decide whether you should enhance your lead guitar tone with a G12-50GL Lynchback or a Classic Lead 80? This is the perfect opportunity to get a PAIR of iconic Celestion IRs at a discounted price! Saturday & Sunday – DOUBLE DEALS! The ‘Magnificent 7’ were the first batch of iconic Celestion impulse responses we launched and are still some of our best-sellers to-date! They comprise the Celestion Blue, G12M Greenback, Vintage 30, G12-65, G12H Anniversary, G12M-65 Creamback and the G12H-75 Creamback. Buy 2 IR cabinets (any speaker type you like) and get the 3rd cabinet free! This offer is ideal if you want to try various Celestion IRs in different cabs. Cyber Monday – 30% OFF EVERYTHING! Get your hands on as many Celestion impulse responses as you want with our mammoth Cyber Monday Deal! We’re offering a massive 30% OFF EVERYTHING in our entire range of Celestion IR speaker cabinets and collections! This offer is perfect if you want to build a wide-ranging IR library of different Celestion speakers and cabinets for different tones and genres. Or if you are just curious about Celestion IRs and want to test the water, we have 20 iconic speakers to choose from – all at a massive 30% off! All speakers, all single cabinets, all collections – ALL 30% OFF! Keep checking celestionplus.com to make sure you get a great deal on Celestion IRs this Black Friday weekend! *Black Friday Weekend Sale IRs do not include Two notes or Positive Grid Software products.